One of the recurring themes of “counter-extremism” groups – be it the latent Radical Middle Way (RMW) and ISB, or the more overt Quilliam Foundation, and the puppeteered Humza Arshad – is that it always tracks back to an agenda to undermine Islam, “reform” it, crush dissent and deflect Western foreign policy critique. This is one of the reasons why, I believe, that our “transparent” public bodies are more resilient in disclosing the organisations they are funding from the counter-extremism pot. A link to PREVENT is all that is needed to expose the soul-destroying efforts of whichever organisation is acting as a conduit for neoconservative, anti-Islam agendas. With the counter-extremism industry growing over the years, a cross-pollination of those neoconservative-based ideas has occurred, primarily between US, UK and Europe. The ideal for the neocons is to mount an ethnocentric, culturalist attack on Islam. History shows us two ways of doing this, as exemplified by Britain’s evolution of the PREVENT Strategy. The current strategy is one of secularisation of Islam through the “British values” social engineering programme. The previous strategy, also designed by the “sophist” (or rather supremacist) minds of neocons is one where apolitical, pacifist readings, usually through the abuse of Sufi Ulama, is posited as the “ideal” Islam. This is a temporary measure only, of course, until the next phase of the neocon agenda of aggressively promoting “progressive Muslims” and “ex-Muslims” is entered, as per the current strategy. This strategy of promoting “moderate Islam” seems to be returning into vogue, as can be seen by Shaykh Abdullah bin Bayyah and Imam Hamza Yusuf-endorsed ImamsOnline initiative. Another recurrent theme is the Zionist interest and involvement in influencing the counter-extremism discourse, with the likes of Mossad internationally monitoring “moderate”, pacifist Muslim movements, and domestically, organisations like the Board of deputies of Jews contributing to the counter-extremism policy. Jumping on the deradicalisation VW Camper Van is “Abdullah-X”, a character of a graphic novel aimed at providing the “counter-narrative”. The character in the initial episodes experiences some sort of divine unveiling, all on the topic of “extremism”. He then possesses a “mind of a scholar” and the “heart of a warrior” who proceeds to provide the counter-narrative to the “extremist” discourse. Not exactly Frank Miller’s Dark Knight then. Having viewed the videos and finding them distinctly crass, possessing the hallmarks of the first version of PREVENT, I ignored it. However, the recent addition of a female character, the very distinctly-named “Muslimah-X”, reignited my interest in the work. The comic has attracted media attention, having been posited as a model method of countering radicalisation. According to one report, the creator of the cartoons is a “former extremist” who once upon a time followed Omar Bakri. Much like the narratives of the comic, the “origin story” of the cartoonist is far from original. Individuals coming from this clan of caricatures also include Maajid Nawaz and Anjem Choudhry, both of whom currently provide narratives to either justify government policy or reinforce it. The creator’s aim is to “take some of that ground back online” from “extremist groups” who have access to the internet. The government, primed by “former-extremists” at Quilliam, has typically endorsed the comics. The Home Office Affairs Committee identifies the Against Violent Extremism (AVE) network which is made up of a number of former extremists and survivors of terrorism. The Committee also mentions the fact that AVE receives funding from private sector—the Gen Next Foundations and Google Ideas. The Committee then notes that “Abdullah-X” has received private funding, though whether these organisations are linked to this project is not made clear. I endured the pain of watching all of the videos. As always, much like ImamsOnline, RMW and others, there are elements of classical authority in them to lend legitimacy. And like RMW, the narratives suffer from selective memory syndrome. At this point I was at the edge of my seat. Who are the paymasters!? To an anti-climactic continuation, the focus remained on the rulers with Abdullah-X telling us that a true Muslim wouldn’t end up in this mess and a true Muslim ruler wouldn’t “ever resort to terrorism” or “selling out”. Rebellion against the government was used as an effective tool to dismantle the Caliphate. Ever since then, Western foreign policy has ensured the suppression in the most brutal fashion, through their placed despots, of any organisation or group which has kept the light of the Shari’ah alive (and yes, “Sunnah” is a constituent of the Shari’ah). This is not the usage of this narrative, I envisage, the creator(s), or the various MPs endorsing these videos (see here and here), had in mind, hence the simplistic narrative. With regards to venting anger, frustration and sadness through protestation, we are asked, is this “Sunnah”? Protests, with the Islamic etiquette in mind has much benefit: awareness, increasing charity, demonstrating and strengthening solidarity with fellow Muslims and instantiating measures to economically assist the Palestinians in order to alleviate their suffering. Indeed the global outrage at the Gaza offensive has ensured negative impact on the reputation of the Zionist entity. The fact that Muslims are being discouraged from protesting against Zionist atrocities in Gaza speaks of the political leanings being pumped through the video. One can also see hints of deconstructionism and “intolerance” of dominant views in classical Islamic tradition. In one video, “fatwa-bots” are shown to add to the poor character’s confusion. Among the examples being impermissible or “bad” are listening to music and having girl-friends. These examples are then lumped in with other hypocritical views and then labelled extreme. The video, by positioning itself as the “moderate” and using music in the videos subtly reinforces the position that mainstream positions are “extreme”. Once again, the music-listening, politically inactive Muslim is being touted as the “moderate”. Such demarcations of “moderate” and “extreme” without giving much definition is in tune with the globally prevalent Muslim “peace initiatives”. The similarity is not incidental; the Twitter account, @TheAbdullahX, shared the video interview of Shaykh Abdullah bin Bayyah by ImamsOnline’s Shaukat Warraich. I commented on this video in my piece here. The Tweet was an approving one: “This is it… this is real”. We are repeatedly asked by the comic in the various videos about whether the actions of ISIS, or even protesting for Palestinians is from the Sunnah. Indeed “the mind of a scholar”, seemingly possessive of an agenda in line with Mossad and neoconservative aims, needs to be asked the same question. Is working with private organisations which have the tentacles of the Zionist anti-Muslim, fear-mongering industry as well deformists from the Quilliam Foundation in them, also “from the Sunnah”? Networking with Zionists and Neocons? A “mind of scholar” would no doubt be reaching out to the grassroots in order to effect change. Generally, the Ulama would do this without much of a show, unless of course the aim was to encourage others. Even this would be done amongst the milieu of those concerned. 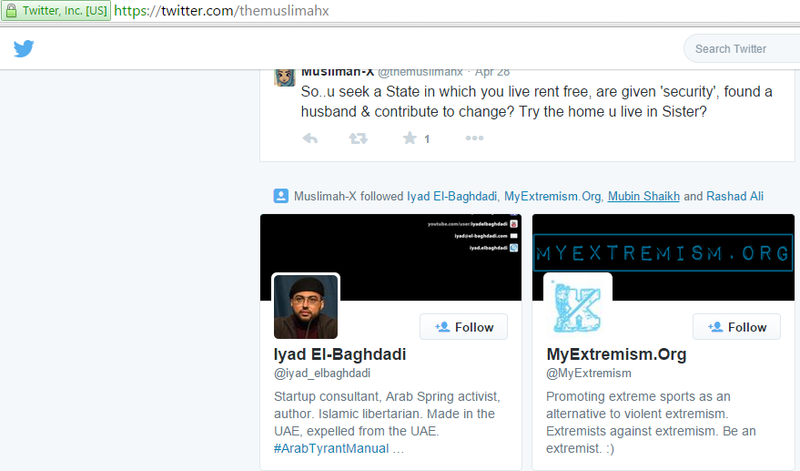 Yet the creators of Abdullah-X seem very keen to get the attention of the media and counter-extremism organisation. It seems to be “marketing” (or selling out?) itself. When the Muslimah-X social network accounts were set up, an intriguing set of organisations and individuals were “followed” immediately. They included the Home Office, House of Lords, Against Violent Extremism, Institute for Strategic Dialogue (ISD), and Hedaya CVE (Countering Violent Extremism). Perhaps Muslimah-X was astute and realised that the UK Government needs some deradicalisation, especially given the neoconservative impulse running through the Westminster. Nope. With further research one realises that the connections of the “Abdullah-X” project reaches into the global counter-radicalisation industry which promotes neoconservative, Zionist aims. This battle of ideas in Britain culminated in the attempt at creating a form of radical nationalism which asserted “British values”, with those not subscribing to them being excommunicated from the new state religion as “extremists”. Here, it was agreed that “harnessing strategic communications across several media – from social networking to traditional print and radio media – is critical in dissuading people from taking a path toward violence”. Born from the GCTF was Abu Dhabi’s “Center of Excellence”: Hedayah. Subsequent CVE seminars encouraged narratives of “ex-extremists” and victims of political violence. Women also come in for special mention in their various publications. One, summarising a meeting held in Washington, 2013, notes that “women are an effective entry point” for a given community being CVE-targeted. I’ll let the feminists mull over the meaning of that. In March 2015, the gender slant took a more meaningful purpose. Influencing the discussion among other organisations was the Institute for Strategic Dialogue (ISD). The London-based ISD has been involved in other meetings too. In May last year, ISD, along with the Waltham Forest Council PREVENT Team attended an “expert” meeting on “Foreign Terrorist Fighters”, where they extolled the virtues of countering “extremist” narratives, without of course mentioning that in the process, Islam was being criminalised. Amongst the list of first signatures are neocon extremists like war-mongering Norman Podhoretz, Michael Ledeen, and the Zionist Nina Rosenwald, financier of the multimillion dollar Islam-hating industry. To rubber stamp the collection of anti-Muslim bigotry, the petition is published by the vile neoconservative outfit Gatestone Institute. Rashad Zaman Ali – the founder of Quilliam known to subvert Muslim communities – also makes an appearance on ISD as a Senior Fellow. Ali was recently added to the Muslimah-X Twitter account. Interestingly, deformist and “British Islam” architect Dilwar Hussain is also present amongst the ISD personnel. This is where things now start to get interesting. AVE is the other account followed by “Muslimah-X”. AVE brings together a “global force” of former “extremists” to counter the “extremist” narrative. A video detailing the story of AVE shows images and sound bites of Maajid Nawaz and JIMAS CEO Abu Muntasir. Muntasir, if we recall, brushes with neocon bigots, props the PREVENT narrative and has spoken at events promoting deformist views. An investigatory report by Dr. Nafeez Ahmed reveals an incestuous relationship between ISD, Gen Next, Quilliam and Google Ideas. Corporate filings show that the US arm of the Quilliam Foundation is registered at the same address Gen Next Inc. in Newport, California. Furthermore, the director of the US version of Quilliam at that time, Michael P. Davidson, is also the CEO of Gen Next and has provided the London-based Quilliam think-tank with $813,000, up until the end of 2013. There were two other directors in 2011: Ed Husain – the founder of Quilliam, and Chad Sweet, who was also on Quilliam’s US board of directors. Sweet is currently campaigning for a racist, anti-Muslim, neocon war-mongering bigot, who has spoken alongside far-right, terrorist-inspiring hate-preacher, Robert Spencer. Sweet’s neocon link doesn’t end there. Sweet has also co-founded the Chertoff Group, chaired by Michael Chertoff. Chertoff is listed as an International Patron of none other than the Nina Rosenwald-funded, bigoted Henry Jackson Society. And the Google Ideas connection? Nafeez informs us that, towards the end of 2009, Quilliam had contributed to a feasibility study for the creation of European network of “former extremists”. The US State Department had sponsored the project. One of the state officials involved at that time was Jared Cohen, an individual personally thanked by Maajid Nawaz in his published autobiography, and with whom he has shared platforms with in the past. Cohen is an adjunct senior fellow at the Council of Foreign Relations (CFR), where he specialises in terrorism, radicalisation, and Iran. Ed Husain it should be noted, is also an adjunct senior fellow there. Cohen founded, and is currently the director of, Google Ideas. 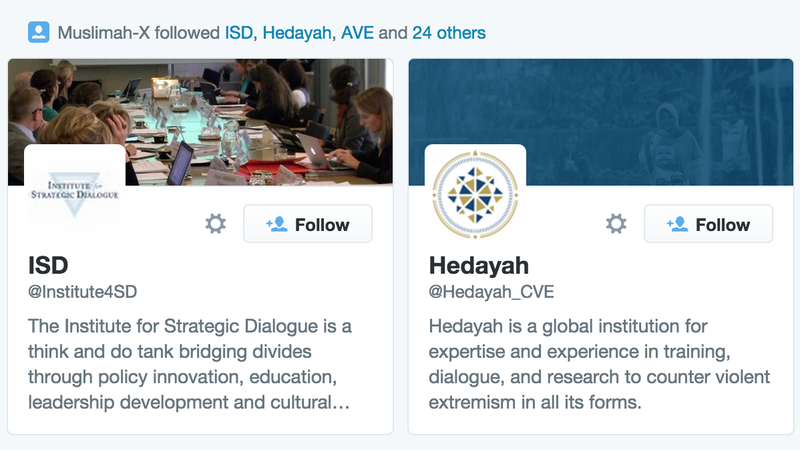 Sure, it can be argued that “following” such organisations does not mean one agrees with them. After all, I follow Quilliam and Maajid Nawaz on Twitter. However, Abdullah-X’s creator’s connection is deeper. Discussing the Counter-Terror Bill, Keith Vaz addressing counter-narratives states that, “we commended the work of Google and its work with Abdullah-X”. Highlighting the “paymasters” of the Arab world whilst remaining silent about his own “paymasters” reveals the reality of the creator of this insipid graphic novel. This is not exactly “Sunnah”. And indeed in line with Abdullah-X’s exhortations, the “bigger picture” is understood. Born from the global, unholy union of neocons, Zionists and Quilliamites, Abdullah-X is, in the Great Game, Abdul Neocon. This entry was tagged Abdullah-X, Against Violent Extremism, AVE, British values, caliphate, Chad Sweet, Council of Foreign Relations, counter-extremism, David Aaronovitch, Dilwar Hussain, Ed Husain, Erin Saltman, extremism, former-extremists, Gatestone institute, Gaza, Gen Next, George Weidenfeld, Global Counterterrorism Forum, Google Ideas, Hedaya, Henry Jackson Society, Humza Arshad, Imam Hamza Yusuf, Institute for Strategic Dialogue, ISB, ISD, Jared Cohen, King Husain, Maajid Nawaz, Michael Chertoff, Michael Ledeen, Michael P. Davidson, Mossad, Muslimah-X, Nafeez Ahmed, neoconservatism, Nina Rosenwald, Norman Podhoretz, Ottoman, Prevent, Quilliam Foundation, Radical Middle Way, radicalisation, Rashad Ali, Rashad Zaman Ali, Shari'ah, Shaykh Abdullah bin Bayyah, Waltham Forest Council PREVENT Team, Zionists. Bookmark the permalink. I don’t think it is accurate to class the Radical Middle Way in any way the same class as the Quilliam Foundation. The Radical Middle Way are an actual Muslim group of actual Muslims who actually believe in Islam and seek the pleasure of Allah. The Quilliam Foundation however doesn’t appear to be any of these things. I don’t think it is at all accurate to suggest that the Radical Middle Way “racks back to an agenda to undermine Islam, “reform” it, crush dissent and deflect Western foreign policy critique.” – although this description fits organizations like the Quilliam Foundation very well. RMW was formed with the express purpose of pushing a “version” of Islam which was pliant with the Labour government’s foreign policy (Iraq/Afghan wars). Beneath the veneer of genuine scholarship courtesy of scholars from the traditional learning, lay deconstructionist tendencies and diffusion of confusion. “Debates” were held with one sided panels followed by activities and performances which endorsed the positions propounded by RMW. This was state-backed “crushing” of dissenting Islamic views to create a “British Islam”. Agreed, Muslims were involved, many sincere as it tallied with the group of scholars they held in esteem (and I knew them also). However, it does not disguise the fact that it was created to fulfil PREVENT objectives, the “covert” one being the creation of Islam “co-opted” by “Muslim liberals”. Its Hedayah, with an “h”. One more comment I wanted to add to the above one: Going by their actions and support of various mutually antagonistic groups in Libya, Yemen, Iraq and Syria combined, it seems the “powers” are really not interested in any viable society of humans in such lands; that is, forget “Islamic Arab polities” or “Secular Arab polities”, it seems destruction and profiteering from war is the sole purpose of these badly-botched interventions that have only gotten worse after the “Arab Spring”. I know it sounds cynical and perhaps fault may be found, but this is the only explanation that seems to make any sense for why powers that can do so much to turn the tide in their favor don’t even seem to have any coherent policy in their interventions. Saudi Arabia – the Land of Tawheed? Triple Attacks: The Neocon Moment?